You know that saying, "when pigs fly"? 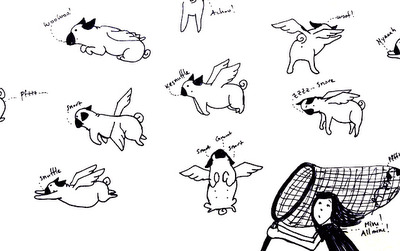 How much awesomer would it be if it were when pugs fly? Just replace the "i" with a "u"! If that ever happened in real life I would so be out there with the largest net I could find and capture as many flying pugs as I could! Oh and because this is also for this week's Illustration Friday theme (vocal), I added some pug sound effects (which interestingly is probably very similar to the noises pigs make). Well, it is different.... but I don't that that'll happen either! Rumpydog - Haha yes, this will likely never happen. But if it was possible, I'd be catching as many as I could! Haha thank you! I tried to think of a way to describe the pug noises other than the typical snort and grunt and kesmuffle just came to me. Like a sneeze/snort sound. And I love your illustrations and blog! Haha, so great! My favorite are the "snuffle" and "kesnuffle". I never really thought about their curly little tails just like a pig. Eek, catch the sleeping one before he runs into a tree! Interesting thought! Ha ha!!! Love the sound effects! !